(Trent Nelson | The Salt Lake Tribune) New Mexico State Aggies guard Clayton Henry (5) on top of Auburn Tigers guard J'Von McCormick (12) as Auburn faces New Mexico State in the 2019 NCAA Tournament in Salt Lake City on Thursday March 21, 2019. (Trent Nelson | The Salt Lake Tribune) New Mexico State Aggies guard Terrell Brown (3) as Auburn faces New Mexico State in the 2019 NCAA Tournament in Salt Lake City on Thursday March 21, 2019. (Trent Nelson | The Salt Lake Tribune) New Mexico State Aggies guard Terrell Brown (3) defended by Auburn Tigers guard Jared Harper (1) and Auburn Tigers guard Malik Dunbar (4) as Auburn faces New Mexico State in the 2019 NCAA Tournament in Salt Lake City on Thursday March 21, 2019. (Trent Nelson | The Salt Lake Tribune) Auburn Tigers head coach Bruce Pearl as Auburn faces New Mexico State in the 2019 NCAA Tournament in Salt Lake City on Thursday March 21, 2019. (Trent Nelson | The Salt Lake Tribune) Auburn Tigers forward Horace Spencer (0) as Auburn faces New Mexico State in the 2019 NCAA Tournament in Salt Lake City on Thursday March 21, 2019. (Trent Nelson | The Salt Lake Tribune) Auburn players huddle, facing New Mexico State in the 2019 NCAA Tournament in Salt Lake City on Thursday March 21, 2019. 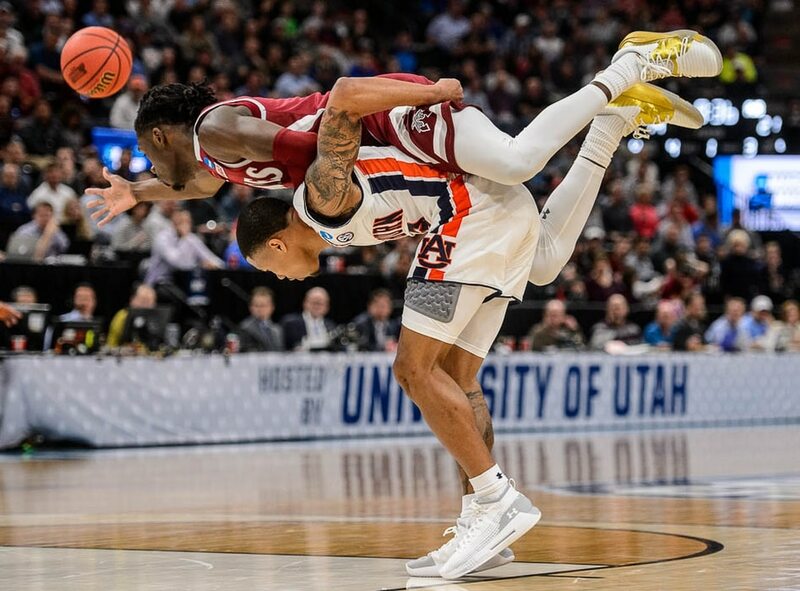 (Trent Nelson | The Salt Lake Tribune) New Mexico State Aggies guard Clayton Henry (5) dives after a loose ball as Auburn faces New Mexico State in the 2019 NCAA Tournament in Salt Lake City on Thursday March 21, 2019. At left is Auburn Tigers guard Malik Dunbar (4). (Trent Nelson | The Salt Lake Tribune) Auburn Tigers forward Horace Spencer (0) and Auburn Tigers forward Chuma Okeke (5) as Auburn faces New Mexico State in the 2019 NCAA Tournament in Salt Lake City on Thursday March 21, 2019. (Trent Nelson | The Salt Lake Tribune) New Mexico State Aggies guard Trevelin Queen (20) as Auburn faces New Mexico State in the 2019 NCAA Tournament in Salt Lake City on Thursday March 21, 2019. (Trent Nelson | The Salt Lake Tribune) Auburn Tigers center Austin Wiley (50) defending New Mexico State Aggies guard Terrell Brown (3) as Auburn faces New Mexico State in the 2019 NCAA Tournament in Salt Lake City on Thursday March 21, 2019. (Trent Nelson | The Salt Lake Tribune) Auburn Tigers guard Samir Doughty (10) fouls New Mexico State Aggies guard Terrell Brown (3) as Auburn faces New Mexico State in the 2019 NCAA Tournament in Salt Lake City on Thursday March 21, 2019. (Trent Nelson | The Salt Lake Tribune) New Mexico State Aggies forward Ivan Aurrecoechea (15) defended by Auburn Tigers forward Horace Spencer (0) as Auburn faces New Mexico State in the 2019 NCAA Tournament in Salt Lake City on Thursday March 21, 2019. (Trent Nelson | The Salt Lake Tribune) New Mexico State Aggies guard Clayton Henry (5) looks for a call as Auburn faces New Mexico State in the 2019 NCAA Tournament in Salt Lake City on Thursday March 21, 2019. (Trent Nelson | The Salt Lake Tribune) New Mexico State Aggies forward Johnny McCants (35), Auburn Tigers forward Anfernee McLemore (24), Auburn Tigers guard Bryce Brown (2) and New Mexico State Aggies guard Trevelin Queen (20) as Auburn faces New Mexico State in the 2019 NCAA Tournament in Salt Lake City on Thursday March 21, 2019. (Trent Nelson | The Salt Lake Tribune) New Mexico State Aggies forward Johnny McCants (35), Auburn Tigers forward Anfernee McLemore (24), Auburn Tigers guard Bryce Brown (2) and New Mexico State Aggies guard Trevelin Queen (20) as Auburn faces New Mexico State in the 2019 NCAA Tournament in Salt Lake City on Thursday March 21, 2019. (Trent Nelson | The Salt Lake Tribune) Auburn faces New Mexico State in the 2019 NCAA Tournament in Salt Lake City on Thursday March 21, 2019. (Trent Nelson | The Salt Lake Tribune) Auburn Tigers guard Samir Doughty (10) reacts to a foul called with 1.7 seconds left, as Auburn faces New Mexico State in the 2019 NCAA Tournament in Salt Lake City on Thursday March 21, 2019. (Trent Nelson | The Salt Lake Tribune) Auburn Tigers guard Bryce Brown (2) celebrates a score as Auburn faces New Mexico State in the 2019 NCAA Tournament in Salt Lake City on Thursday March 21, 2019. (Trent Nelson | The Salt Lake Tribune) New Mexico State Aggies forward Johnny McCants (35) as Auburn faces New Mexico State in the 2019 NCAA Tournament in Salt Lake City on Thursday March 21, 2019. (Trent Nelson | The Salt Lake Tribune) New Mexico State Aggies guard AJ Harris (12) as Auburn faces New Mexico State in the 2019 NCAA Tournament in Salt Lake City on Thursday March 21, 2019. 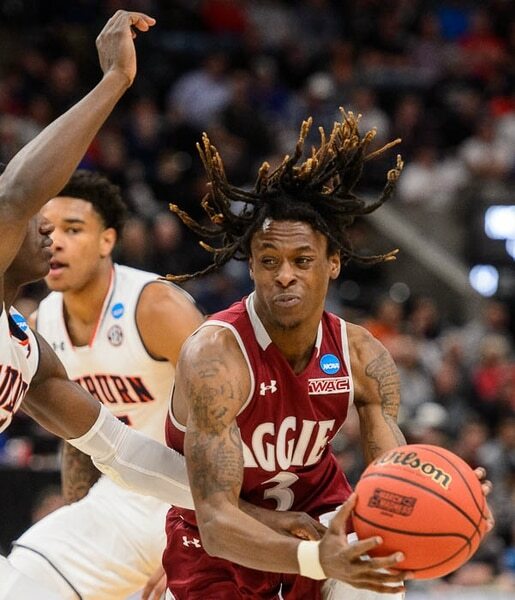 (Trent Nelson | The Salt Lake Tribune) New Mexico State Aggies guard Trevelin Queen (20) as Auburn faces New Mexico State in the 2019 NCAA Tournament in Salt Lake City on Thursday March 21, 2019. (Trent Nelson | The Salt Lake Tribune) Auburn fans as Auburn faces New Mexico State in the 2019 NCAA Tournament in Salt Lake City on Thursday March 21, 2019. (Trent Nelson | The Salt Lake Tribune) New Mexico State head coach Chris Jans as Auburn faces New Mexico State in the 2019 NCAA Tournament in Salt Lake City on Thursday March 21, 2019. (Trent Nelson | The Salt Lake Tribune) New Mexico State fans look on in the final seconds as Auburn faces New Mexico State in the 2019 NCAA Tournament in Salt Lake City on Thursday March 21, 2019. (Trent Nelson | The Salt Lake Tribune) Auburn Tigers guard Bryce Brown (2) celebrates a score as Auburn faces New Mexico State in the 2019 NCAA Tournament in Salt Lake City on Thursday March 21, 2019. (Trent Nelson | The Salt Lake Tribune) An Auburn fan bows her head during a free throw as Auburn faces New Mexico State in the 2019 NCAA Tournament in Salt Lake City on Thursday March 21, 2019. (Trent Nelson | The Salt Lake Tribune) New Mexico State Aggies guard Terrell Brown (3) and New Mexico State Aggies guard AJ Harris (12) react to a call as Auburn faces New Mexico State in the 2019 NCAA Tournament in Salt Lake City on Thursday March 21, 2019. (Trent Nelson | The Salt Lake Tribune) New Mexico State's mascot, as Auburn faces New Mexico State in the 2019 NCAA Tournament in Salt Lake City on Thursday March 21, 2019. (Trent Nelson | The Salt Lake Tribune) Auburn Tigers guard J'Von McCormick (12) plays air guitar to celebrate a basket as Auburn faces New Mexico State in the 2019 NCAA Tournament in Salt Lake City on Thursday March 21, 2019. (Trent Nelson | The Salt Lake Tribune) Auburn Tigers guard J'Von McCormick (12) runs into New Mexico State Aggies guard JoJo Zamora (4) as Auburn faces New Mexico State in the 2019 NCAA Tournament in Salt Lake City on Thursday March 21, 2019. (Trent Nelson | The Salt Lake Tribune) New Mexico State Aggies forward Ivan Aurrecoechea (15) and Auburn Tigers center Austin Wiley (50) reach for the ball as Auburn faces New Mexico State in the 2019 NCAA Tournament in Salt Lake City on Thursday March 21, 2019. (Trent Nelson | The Salt Lake Tribune) Auburn Tigers guard Malik Dunbar (4) shows a sheepish smile after a very close win, as Auburn faces New Mexico State in the 2019 NCAA Tournament in Salt Lake City on Thursday March 21, 2019. New Mexico State guard Terrell Brown stood at the free-throw line with 1.1 seconds remaining, and every shot looked and felt good as the ball left his hand Thursday. The first attempt, that potentially could have given the No. 12-seeded Aggies a first-round victory in the NCAA Tournament. The second try, that swished through the net. The third shot, that could have forced overtime vs. Auburn. “I seen in his face he was pretty scared,” Auburn guard J'Von McCormick said, but none of Brown's shots missed badly. And then came an airball from the left corner, with NMSU guard Trevelin Queen's desperate shot sailing over the basket, after the rebound was knocked out of bounds and the Aggies got one last chance in a 78-77 loss at Vivint Smart Home Arena. 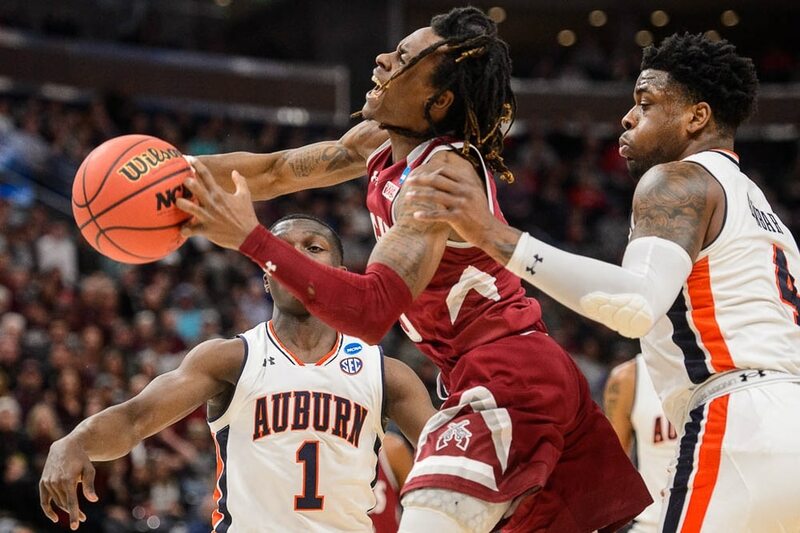 That's the story, really: Auburn didn't win this game, as much as New Mexico State missed its opportunity to complete a remarkable comeback as the Western Athletic Conference champions' 19-game winning streak ended. Junior guard Jared Harper led Auburn with 17 points; sophomore forward Johnny McCants scored 17 for NMSU. • No. 5 seed Auburn holds on for a 78-77 win over New Mexico State, despite being outscored 23-11 in the final seven minutes. • Former Utah guard JoJo Zamora makes two 3-pointers for NMSU, including one with 6.8 seconds left. • NMSU’s losing streak in the NCAA Tournament has lasted since 1970, partly due to vacated wins in the early 1990s. The Tigers (27-9) advanced In the Midwest Region only after losing most of a 13-point lead in the last seven minutes. Auburn never trailed in the second half, but couldn't subdue the Aggies until the very end. “We obviously panicked and made our share of mistakes, which could have cost us the game,” said Auburn coach Bruce Pearl. Auburn advanced, though. “I told my team that the toughest one for us to win was probably going to be the first one,” Pearl said. No. 4 seed Kansas may disagree, and nothing about Auburn's opening-round matchup looked especially difficult, once the Tigers made a 13-0 run midway through the first half. NMSU (30-5) rallied to within 32-29 at halftime, but Auburn opened the second half with a 13-4 burst and stayed comfortably in front via timely 3-point shooting. Yet, the Tigers failed to finish properly, and an adventurous final minute unfolded. Former Utah guard JoJo Zamora’s 3-pointer cut Auburn’s lead to 77-76 with 6.8 seconds left, before the Tigers’ Samir Doughty missed one free throw and made the next attempt. NMSU's AJ Harris drove down the court, almost all the way to the rim, then passed back to Brown, who launched a shot and was fouled by Auburn's Bryce Brown. That foul would have been talked about for a long time in southeastern Alabama, but Terrell Brown – a 78-percent shooter – couldn't capitalize.